The main components of initial radiation emitted in the air within 1 minute of the explosion were gamma rays and neutrons. Man is exposed to approximately 0.1 rad of natural radiation per person per year. It is said that 50% of persons who receive a whole body dose of 400 rad, which is known as a semi-lethal dose die, and that those exposed to whole body radiation of 700 rad or more have little chance of escaping death. For the purpose of radioï¿½logical protection, the International Committee on Radiological Protection (ICRP) stipulates the permissible dose for man in general as 0.5 rad per year to the whole body, gonads, or bone marrow. The location that was exposed to the lethal dose of 700 rad was a point approximately 925 meters away from the hypocentre (in Hiroshima); and in the case of the semilethal dose of 400 rad, apï¿½proximately 1,025 meters. Anyone exposed without shielding within this distance is said to have been seriously affected by the initial radiation, and approximately 20% of deaths are said to be attributable to these effects. The location that was exposed to the permissible dose for human beings (0.5) rad was determined to be a point approximately 2.3 kilometers away from the hypocentre. Residual radioactivity was present on the ground for a long period of time from 1 minute after the explosion. It consisted of induced radioactivity produced secondarily as a result of the nuclear reaction of neutrons when the initial radiation collided with the soil and building materials; of radioactivity of nuclear fission products; and of radioactivity of unfissioned bomb materials. Anyone staying within 1 kilometer of the hypocentre within 100 hours of the explosion was seriously affected by external exposure to gamma rays of induced radiation; therefore, those who were not exposed to the initial radiation but entered the city to aid victims or search for relatives and those who lived in the range of radioï¿½active contamination were affected by residual radiation. Delayed effects of radiation were caused by the complicated involvement of three factors; namely, burns due to thermal radiation and fire, injuries due to the blast, and radiation effects. 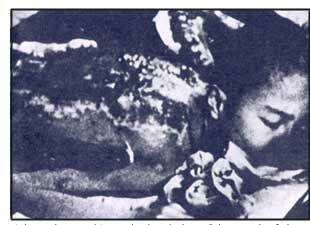 The effect of radiation had a synergistic action with the burns due to thermal radiation and fire and the injuries due to tFf~ blast and generally aggravated the condition of the diseases of those exposed. Acute sickness is a symptom that developed in the period from the time of the explosion to the end of December the same year, and most of the people are said to have recovered from the sympï¿½toms 5 months after the explosion. They are: digestive symptoms (nausea, vomiting, and diarrhea); nerve symptoms (headache, deï¿½lirium and insomnia); a dynamic symptoms (epilation, weakness, and malaise); bleeding symptoms (hematemesis, bloody discharge from the bowels, hematuria, nosebleed, gingival bleeding, genital bleeding, and subcutaneous bleeding); inflammation symptoms (fever, pharyngalgia, stomatitis, and dermatitis); blood symptoms (leukocytopenia and erythrocytopenia); genital organ symptoms (aspermia and menstrual abnormalities). Of the total of 140,000 deaths in the period of acute sickness, approximately 20% were from injuries due to the blast, approxiï¿½mately 60% from burns due to thermal rays and fire, and the reï¿½maining 20% due to radiation disturbance. Most of the people who did not die of acute sickness superï¿½ficially appeared to be in good health at the end of December of the year of the bombing. However, medical effects due to the atomic bomb did not end. 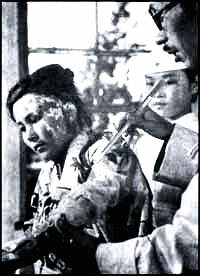 Burns due to the atomic bomb, healing once, formed keloids in 1-4 months with the protuberance of their scars. Keloid inciï¿½dence shows a peak in the period of 1946-47. Ophthalmological disorders such as traumatic cataracts, and blood dyscrasias such as leukemia appeared around 1947. Leukemia incidence, especially, shows a peak in the period of 1950-60. Incidence of malignant tumors such as thyroid cancer, breast cancer, lung cancer, and saliï¿½vary gland tumor generally increased from around 1960 after the peak of leukemia incidence, and is still observed. Adding to these, nerve problems such as easy fatigability, dizziï¿½ness, and insomnia, aging and sickness due to in utero exposure have been observed. As to genetic effects of radiation, no definite eviï¿½dence has been obtained. This is a problem that requires further study and research.